This antibody detects endogenous levels of MAP3K8/COT only when phosphorylated at threonine 290. Synthetic peptide corresponding to Human MAP3K8/COT. Our Abpromise guarantee covers the use of ab51214 in the following tested applications. 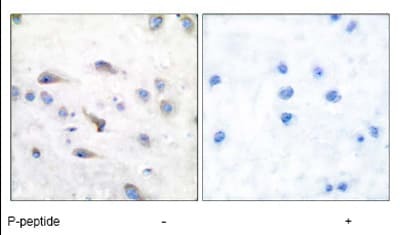 Immunohistochemical analysis of paraffin-embedded human brain tissue using MAP3K8/COT (phospho-Thr290) at a 1/50 dilution. Publishing research using ab51214? Please let us know so that we can cite the reference in this datasheet. There are currently no Customer reviews or Questions for ab51214.